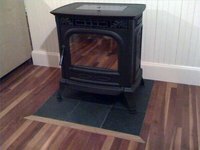 Proper maintenance is one of the keys to getting the best performance out of your pellet stove. Always follow your manufacturer's maintenance recommendations. Keeping the hopper and auger in good working order will prevent any blockages that could starve your stove of fuel at a critical moment. Follow the steps below to keep the hopper and auger clean and in good working condition. Burn all the fuel in the hopper before adding more. Do this after every ton of fuel you burn to avoid sawdust building up and blocking the tubes and the auger. Vacuum out the hopper to remove all the fuel when the stove is cool and will not be used. Add a coat of Pam or another light oil to the hopper, auger and auger tube after the heating season is over. Do not leave fuel in your stove over the summer because it will attract mice.